Xylem and phloem are the two main types of complex tissues found in plants. Xylem is also called hydromel and is responsible for the conduction of water in plants. Xylem contains heterogeneous cells in structure and function like parenchyma cells, xylem fibers, vessels, and tracheids. Phloem is responsible for the conduction of food. It also contains heterogeneous cells like parenchyma cells, phloem fibers, sieve elements and companion cells. Xylem mostly consists of dead cells whereas the phloem mostly consists of live cells. The main difference between xylem and phloem is that xylem is involved in the transportation of water and minerals from roots to the apical parts of the plant whereas phloem is involved in the transportation of food and mineral from leaves to the growing and storing parts of the plant. Xylem is one of the two complex vascular tissues found in plants. It is involved in the transportation of water and minerals unidirectionally, from roots to the leaves of the plants. Hormones and some small molecules are also transported along with water. The transportation of water is completely a passive process. It is driven by two factors: root pressure and transpirational pull. Water in the soil enters the roots by osmosis due to root pressure. Water is lost from the stomata of leaves due to transpiration. Surface tension pulls water from roots to leaves due to transpiration. Four types of cells can be found in the xylem. They are tracheids, vessels, xylem fibers and xylem parenchyma cells. Xylem fibers and parenchyma cells are involved in the structural support of most of the plants. Parenchyma cells are the only cells found alive in the xylem. Tracheary elements are the tubes, involved in the transportation of water and minerals. Two types of tracheary elements are identified: tracheids and vessels. Tracheids are long and vessel elements are short. Vessel elements are connected together, forming tubes called vessels. Primary xylem is developed from the procambium. Protoxylem is the first derived primary xylem. It is developed into the metaxylem containing wider vessels than protoxylem. Secondary xylem is developed from vascular cambium during the secondary growth of the plant. 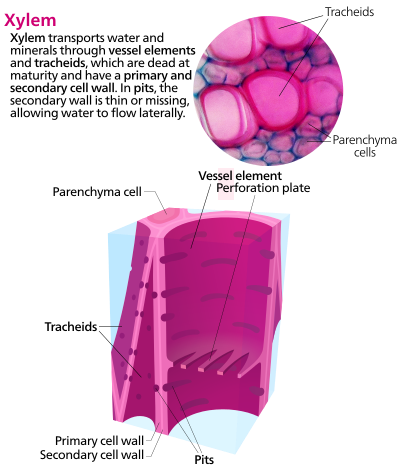 Types of cells in the xylem is shown in figure 1. Phloem is the other complex vascular tissue type found in plants, involved in the transporting sugars and other metabolic products bidirectionally from leaves to storage tissues and from storage tissues to growing parts. It is found in the outermost layer of the bark. Transportation of food through phloem is called translocation. It occurs by active transport, by using energy from ATP, according to the concentration gradient of sugars. Four types of cells are found in the Phloem: parenchyma cells, phloem fibers, sieve elements and companion cells. Sieve elements and companion cells are closely located, forming sieve element/companion cell complex. Sieve elements are called sieve tube member in angiosperms and sieve cell in gymnosperms and ferns. Sieve plate is only found in the angiosperms. It allows the flow between two adjacent cells. Companion cells provide the life support to the sieve element. Types of cells in the phloem is shown in figure 2. Xylem: Xylem is one of the complex tissue found in plants, involved in the transportation of water and minerals from roots to the apical parts of the plant. Phloem: Phloem is the other complex tissue found in plants, involved in the transportation of food and mineral from leaves to the growing and storing parts of the plant. Xylem: Xylem carries water from roots to leaves. Phloem: Phloem carries food from leaves to growing parts and storage organs. Xylem: Xylem is made up of dead cells. Phloem: Phloem is made up of living cells. Xylem: Cell walls of the xylem is thick. Phloem: The cell walls of the phloem is thin. Xylem: Cell wall of the xylem is made up of lignin. Hence, it gives the rigidity to plants. 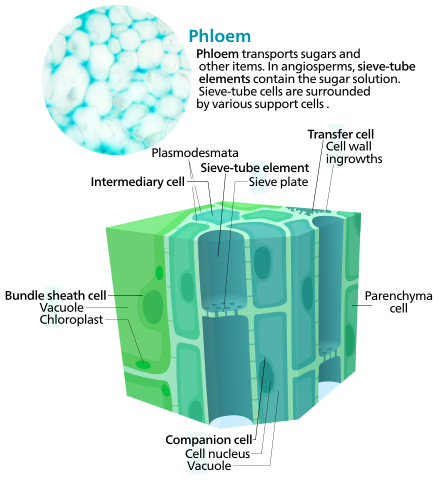 Phloem: Cell wall of the phloem is made up of cellulose. Xylem: The cells in the xylem are impermeable to water. Phloem: The cells in the phloem are permeable to food. Xylem: The cells in the xylem do not have a cytoplasm. Phloem: The cells in the phloem consist of cytoplasm, lining the cavity of phloem. Xylem: Xylem carries water in a unidirectional manner, from roots to apical parts of the plant. Phloem: Phloem carries food bidirectionally from leaves to storage parts and from the storage parts to growing parts. Xylem: Xylem consists of xylem parenchyma, xylem fibers, trachieds, and vessels. Phloem: Phloem consists of phloem parenchyma, phloem fibers, sieve tubes, sieve cells and companion cells. Xylem: Xylem cells are dead cells other than the parenchyma cells. Phloem: All the cells except phloem fibers are alive. Xylem: The conducting elements are vessels and trachieds. Phloem: The conducting elements are sieve tube. Phloem: Phloem is not star-shaped. Xylem: Xylem is found in the center of the vascular bundle. Phloem: Phloem is found in the outside of the vascular bundle. Xylem: In older plants, xylem occupies bulk of the plant body. Phloem: Phloem occupies a small part of the plant body. Xylem: Xylem vessels do not consist of a septa. Phloem: Sieve tubes consist of bulging and porous septa. Xylem: Passive transportation of water and minerals occur in xylem. Phloem: Active transportation of sugars and other metabolites occur in phloem. Xylem and phloem are two types of vascular tissues of plants. Xylem are hard-walled tubular cells, transporting water and minerals unidirectionally from roots to leaves. Phloem are the soft-walled tubular cells, transporting minerals and food in the form of sucrose, bidirectionally, from leaves to storage tissues and from storage tissues to growing tissues. Thus, the main difference between xylem and phloem is in the material transported by each of the two vascular tissues. Both xylem and phloem contain parenchyma cells and fibers. Tracheids and vessel elements are involved in the transportation of water and minerals in xylem. Sieve elements are involved in the transportation of sugars and metabolic products throughout the plant, starting from leaves. The transportation in xylem occurs in the passive mode, while the transportation in phloem occurs in active mode. 1. “Xylem.” Plant Vascular System Development . Michigan State University, n.d. Web. 17 Apr. 2017. 2. “Pholem.” Plant Vascular System Development . Michigan State University, n.d. Web. 17 Apr. 2017. 3. “Phloem structure and function.” Plants in Action. Australian Society of Plant Scientists, n.d. Web.